Nokia is trying to capitalize on the upcoming Valentine's Day annual holiday. Giving customers the chance to spend money on gifts for the loved ones is one way to fill up the coffers, right? And as we all know, a hybrid watch makes a great gift, especially if it's a stylish one like the Nokia Steel HR. If you've been looking for the perfect Valentine's Day gift, Nokia's latest Rose Gold Steel HR smartwatch may match your standards. 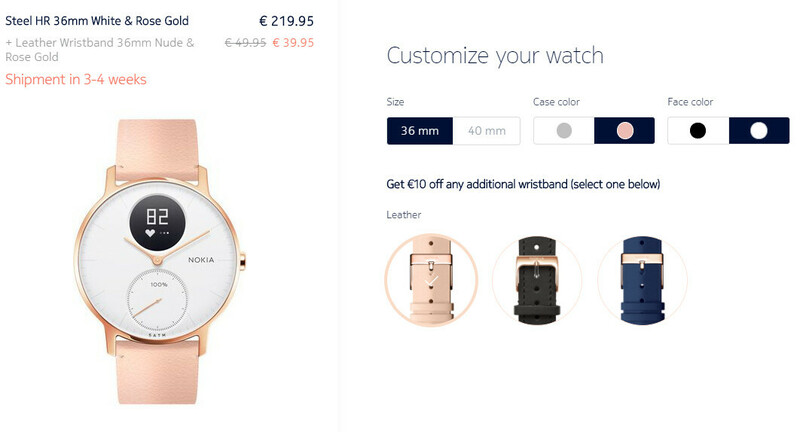 Unlike the regular version that costs €189, the new Nokia Steel HR in Rose Gold is priced to sell for €220. However, you can add one extra leather wristband when you purchase the Nokia Steel HR and pay €10 less than the MSRP. Keep in mind though that these leather wristbands aren't cheap at all, so even with the discount, you'll still have to come up with €39.95. One last thing that's worth mentioning is the Nokia Steel HR in Rose Gold will ship in 3-4 weeks, so if you plan to gift one on Valentine's Day, then you should consider ordering one in the next few days if you want to receive it by February 14.